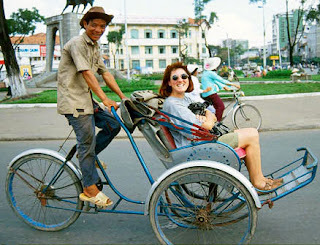 Cyclos -- three wheeled bikes -- are popular with tourists in Vietnam. I'm as excited as anyone about the prospect of a Vietnamese restaurant in Idaho Falls. We've had Thai food covered for a while, and Indian food got a foothold two years ago with Tandoori Oven. Now I notice that Cyclo will be setting up where Togo's used to be, at 2994 S. 25th East. I haven't had any luck tracking down the principals in this project, but my digging has gotten me this much information so far. Cyclo Vietnamese Cuisine LLC is an Idaho limited-liability company filed on March 9, 2016. The registered agent on file for this company is Cody Do, and is located at 3260 N Lake Grove #101, Boise, ID 83713. I will be keeping tabs on this. If you know anything, post here or on Facebook. This is social media, after all. Cheers! FYI, Cyclo seems to be a pretty common name for Vietnamese restaurants in the States. The cyclo is a three-wheel bicycle taxi that appeared in Vietnam during the French colonial period after a failed attempt to introduce rickshaws. A double-seat cyclo is supported by the two front wheels, with the driver sitting behind. Love everything Ive tried here. Always has good flavor in the food and a good mix of veggies and meats. Favorite thing for sure is the pork and shrimp spring rolls. Always taste so fresh. And they deliver now too!